Fred Dunn, though he chose a life of relative obscurity, was one of Toronto’s most inspiring characters. Born April 4, 1923, Fred was a poet, peace activist, carpenter, long distance runner, and a friend to Street Health. With his stark red hair and beard, and his piercing blue eyes, “Uncle Fred” was known for many unique attributes. He was very well-read, with interests in Toronto history, politics, science, biographies, and poetry. Especially, poetry. He was not only an avid reader of laconic verse, he was also prolific at creating it. With over 1,000 poems to his credit, Fred was a romantic and a storyteller, his tales recounted in heartfelt iambic pentameter. Even into his senior years, he could be seen running barefoot (training for the Olympics) with an 80-pound weight on his shoulder –even in the snow! He twice stood as a candidate for mayor of Toronto. But, beyond his various interests and abilities, Fred Dunn was admired for how…and for where… he chose to live. Fred always remained a fiercely independent spirit who didn’t believe in sitting idle, hoping the government would take care of him. Although he didn’t have much money, he never collected social assistance, was always prepared to adjust his levels of consumption, excluded excesses, was able to find joy and satisfaction in the simple things in life, and even made a point of donating to charity. Although people tried to find him conventional housing, he chose there too to remain independent. For 14 years (including during harsh winters), Fred lived in a wooden shack he built for himself in the Don Valley ravine, near the Bayview extension. Uninsulated, unheated, without running water or electricity –but Fred always felt that this place was more of a home than any over-crowded shelter could ever be. He would’ve told you, proud of his self-sufficiency, that he was not “homeless”, he was living an alternative lifestyle of his own choice and of his own making. He chose to be helpful, kind, poetic, to believe that peace was more natural to us than conflict, and to assert our collective responsibility for working toward that peace. For years, Fred would visit Street Health, working primarily with Barb Craig –the street nurse who was known as a “Mom to the homeless”, and who helped define Street Health’s mission and methods. It was Barb who found Fred in that ravine, helped secure his unclaimed pension income, nursed and supported him (only when he asked for it! ), and eventually got him housing when his vision was too poor to live so independently. But remember, Fred was also very generous, and as a way to give back, he asked his artist friend to paint a picture of our home-office. Numerous books, poetry reviews, and newspaper articles [Joe Fiorito, Toronto Star] have honoured Fred Dunn, but for Street Health, his most touching gift was that he chose to honour us! Urs’ human compassion is matched by his innovative techniques. To allow him to paint in the winter, without his paint and hands freezing, he uses a special tool he invented himself. His “two-hand painting box” is a converted wooden crate –with enough space for the canvas, the paint, both hands, and a small oil lamp used for heat. 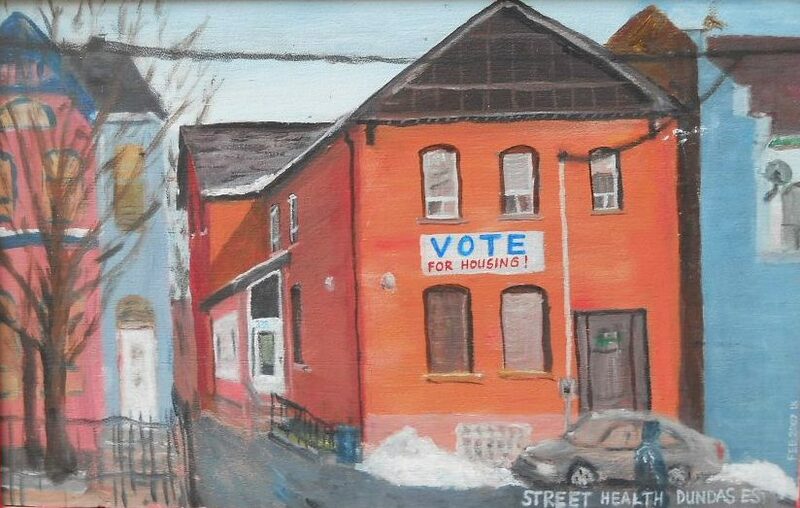 In July 2012, on the very day that we were setting up Facebook and Twitter accounts (and in need of a profile picture), Urs came into Street Health to return his painting to our office. This 2007 work-of-art is painted on wood, measures 10” x 16”, is on display in our reception area, and is now the warm, human, organic face of our agency’s social media presence. Fred Dunn passed away in 2008 but his legacy lives on today, into the era of global internet community.